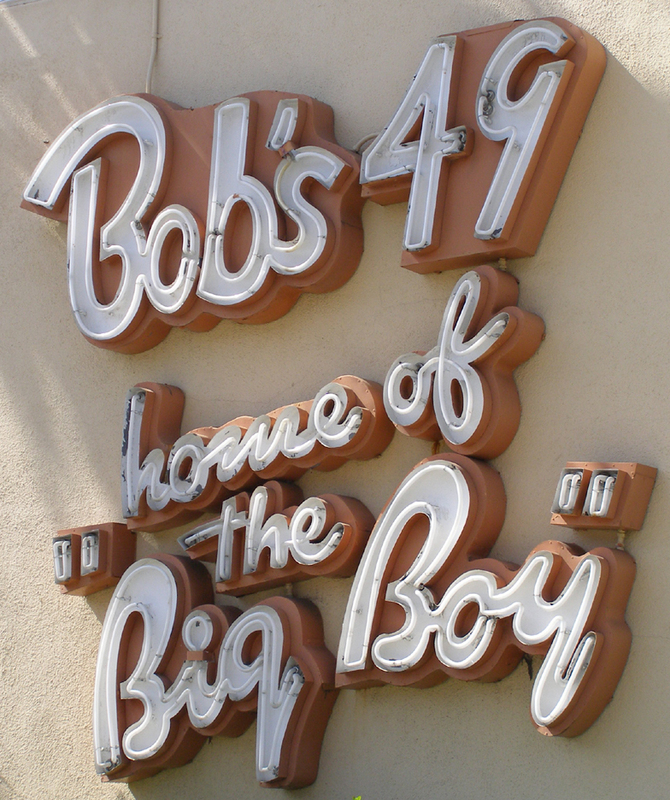 The history of Bob's Big Boy and Big Boy restaurants can be traced back to 1936 when Bob Wian bought a local Glendale restaurant and named it Bob's Pantry. 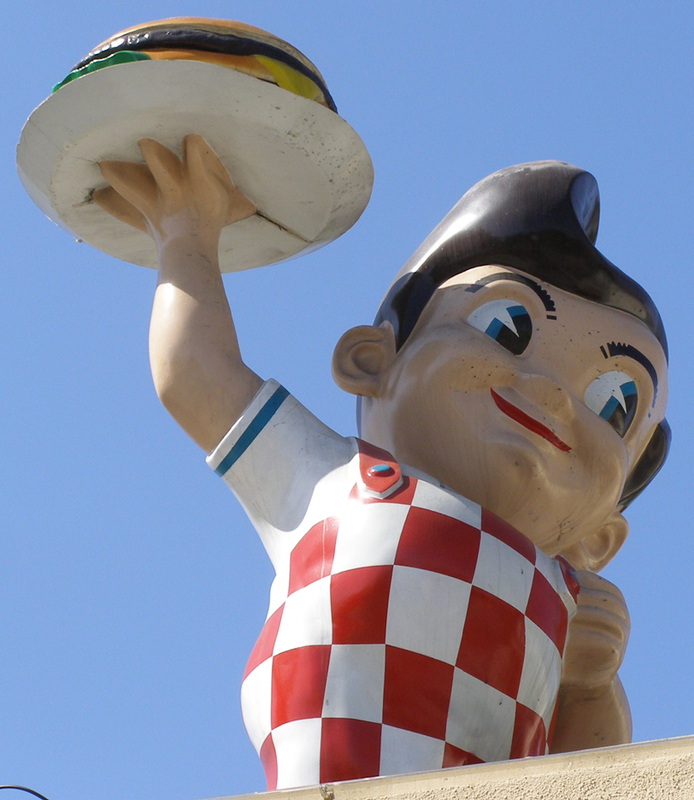 Wian supposedly originated the double-decker hamburger and came up with the Big Boy character. 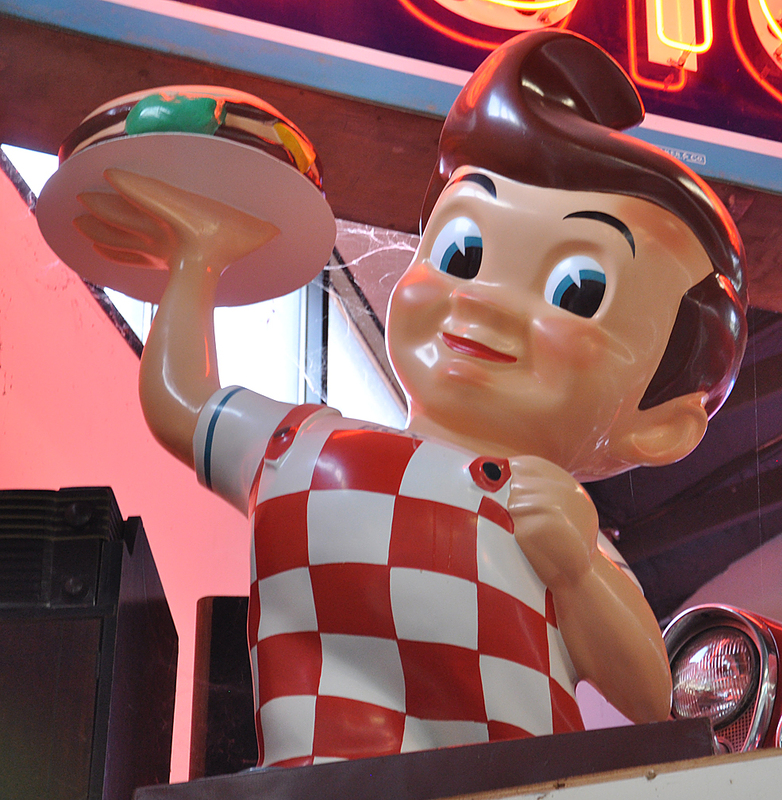 Bob's Big Boy became a California chain and began franchising in the 1940s. 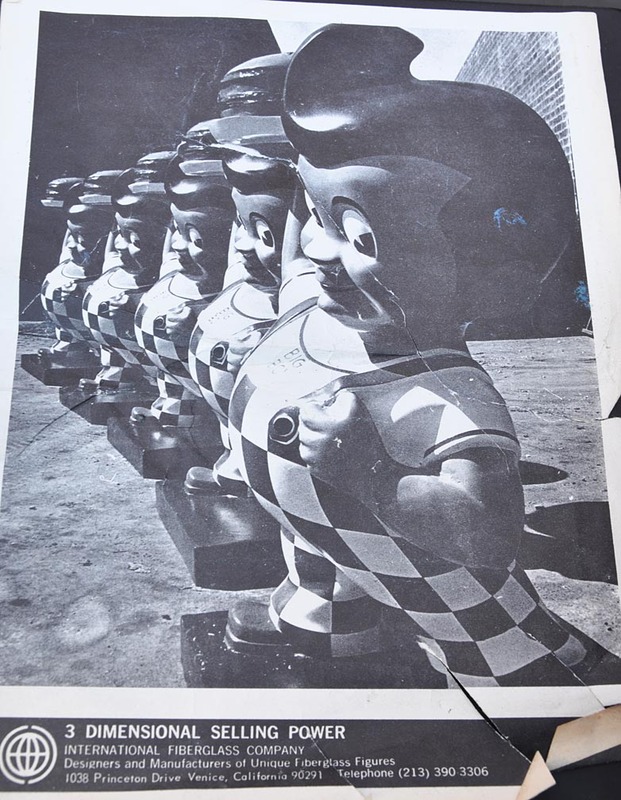 Unlike other chains like McDonald's, Wian did not require uniformity. 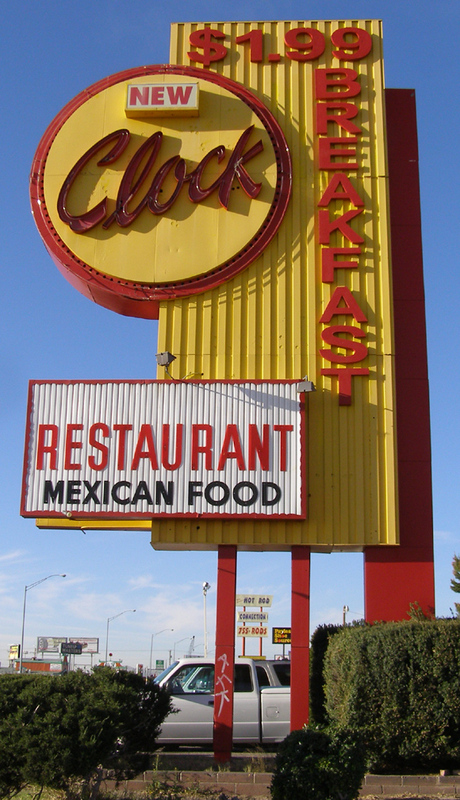 Franchise owners were free to name their restaurants whatever they wanted. 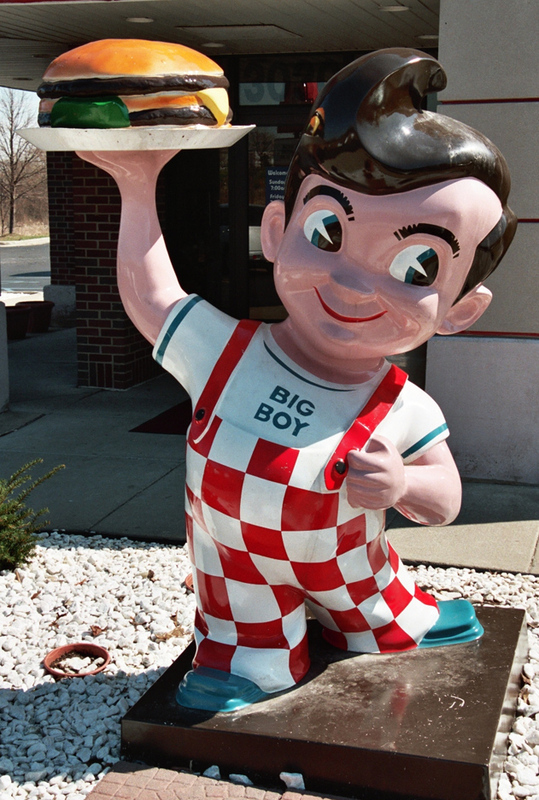 The restaurants were known as Frisch's Big Boy and Manners Big Boy in Ohio. 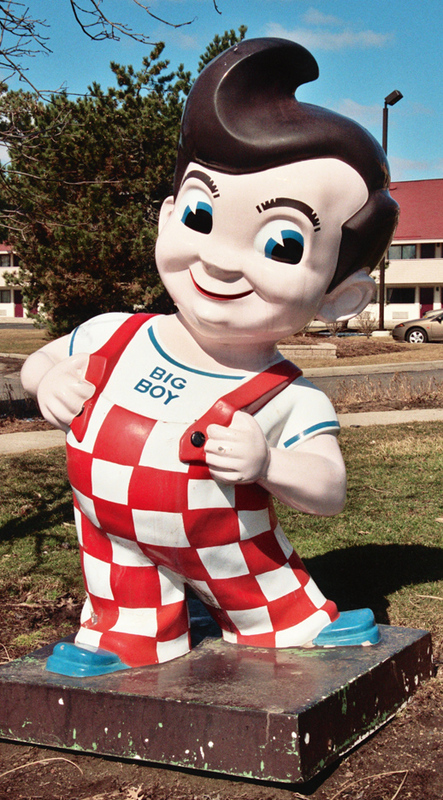 Frisch's and Manners Big Boy restaurants used the same skinnier, running boy as their mascot. 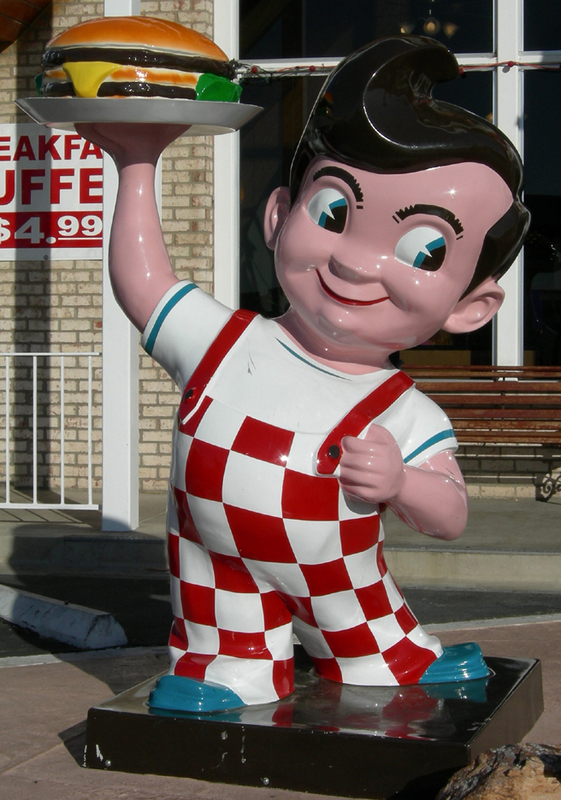 In the late 1970s, Manners locations became Bob's Big Boy restaurants. 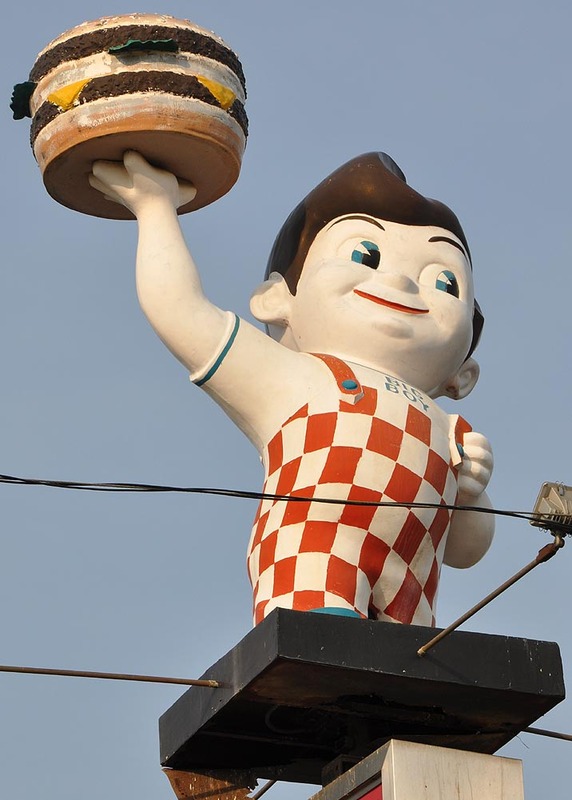 The restaurants were known as Elias Brothers Big Boy restaurants in Michigan, Northeastern Ohio, and Ontario. 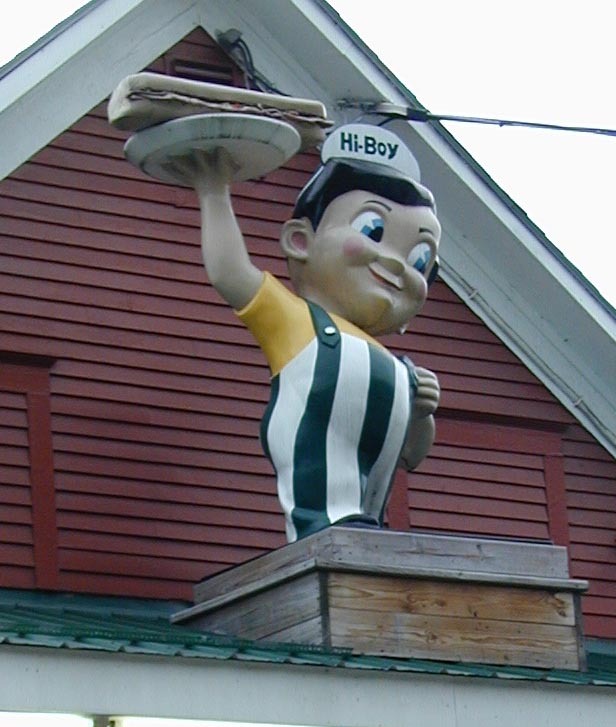 The Elias brothers had their own restaurants before becoming a Big Boy franchisee in 1952. 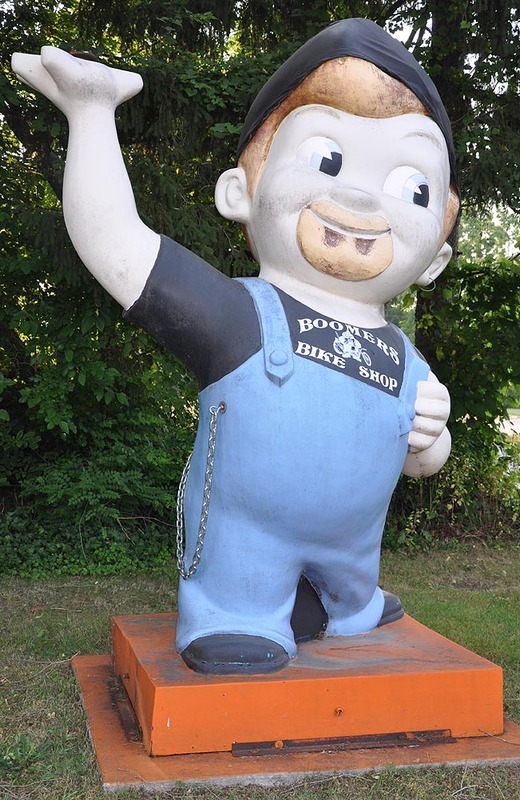 The company kept the Elias name and added the Big Boy character and "Home of the Big Boy" to their signs and advertising. 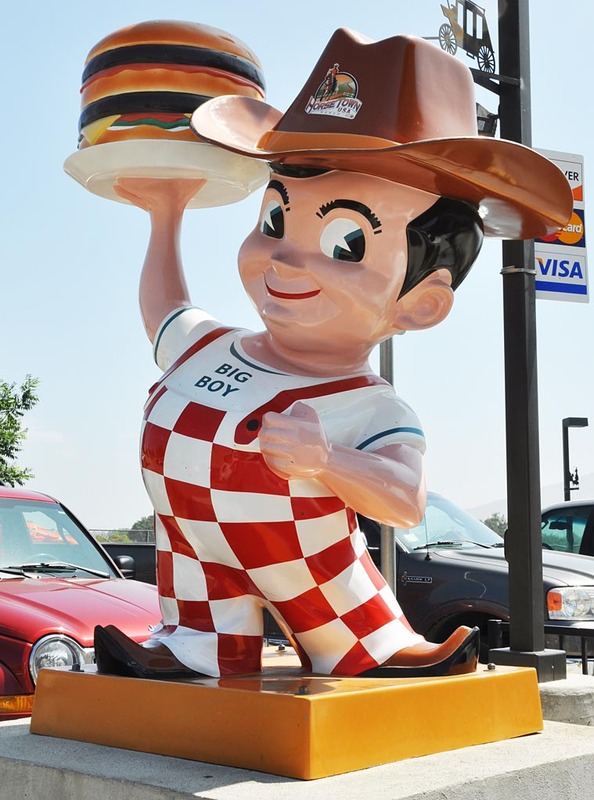 In 1987, they acquired the Big Boy chain's franchise rights from Marriott Corp. Big Boy is now Michigan-based and has about 450 restaurants in California, Arizona, Hawaii, North Dakota, Illinois, Michigan, Ohio and North Carolina. For more, see these websites: 1, 2, and 3. 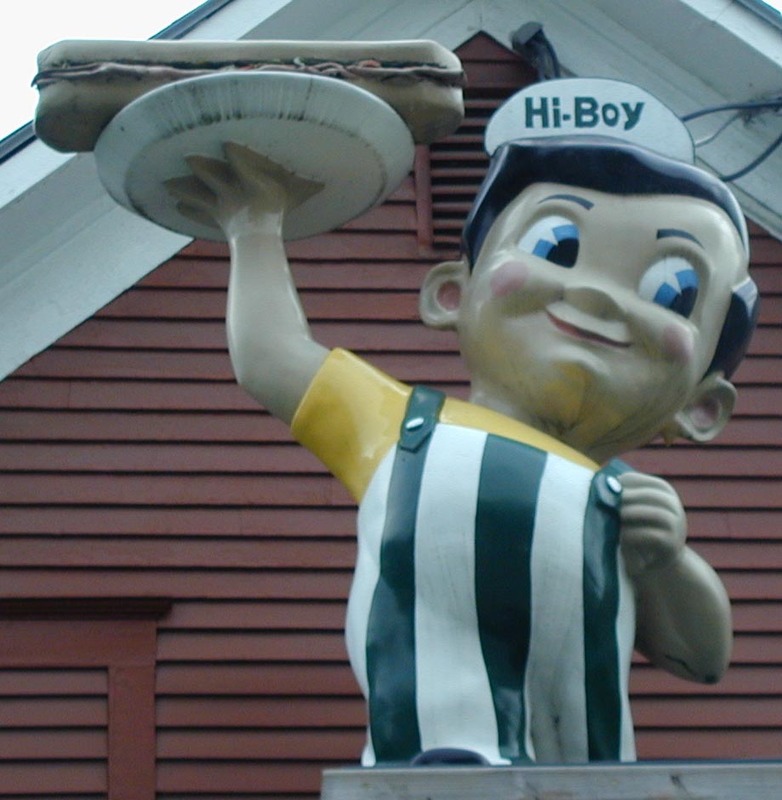 The Hi-Boy Sandwich Shop had a Big Boy statue on the roof. 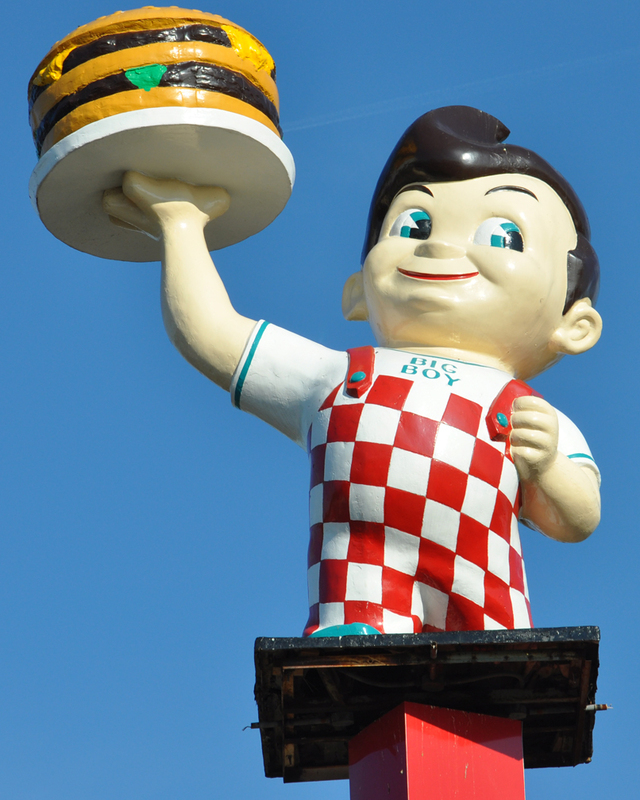 The statue was altered to hold a plate with a sandwich instead of a burger. 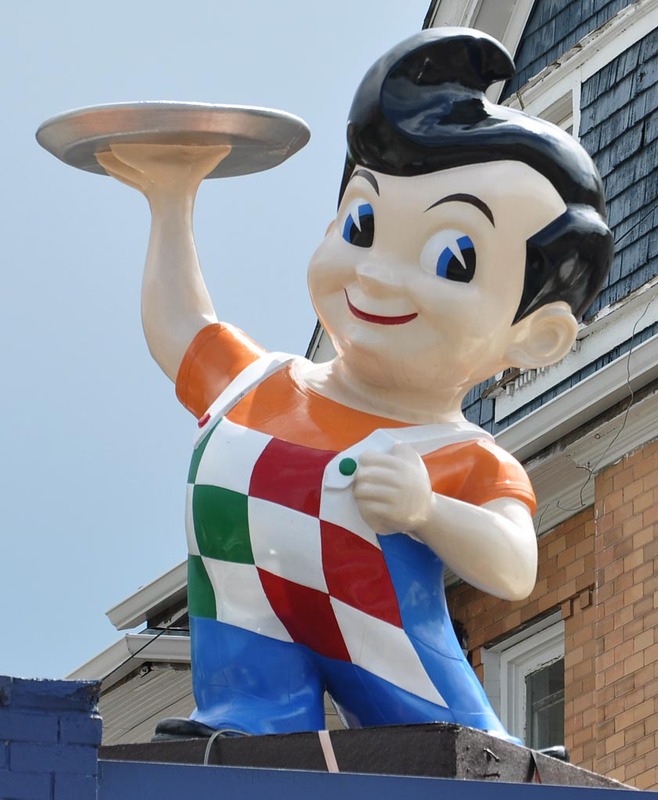 The building now houses the Pizza Man and the statue is gone. For more, see this website. 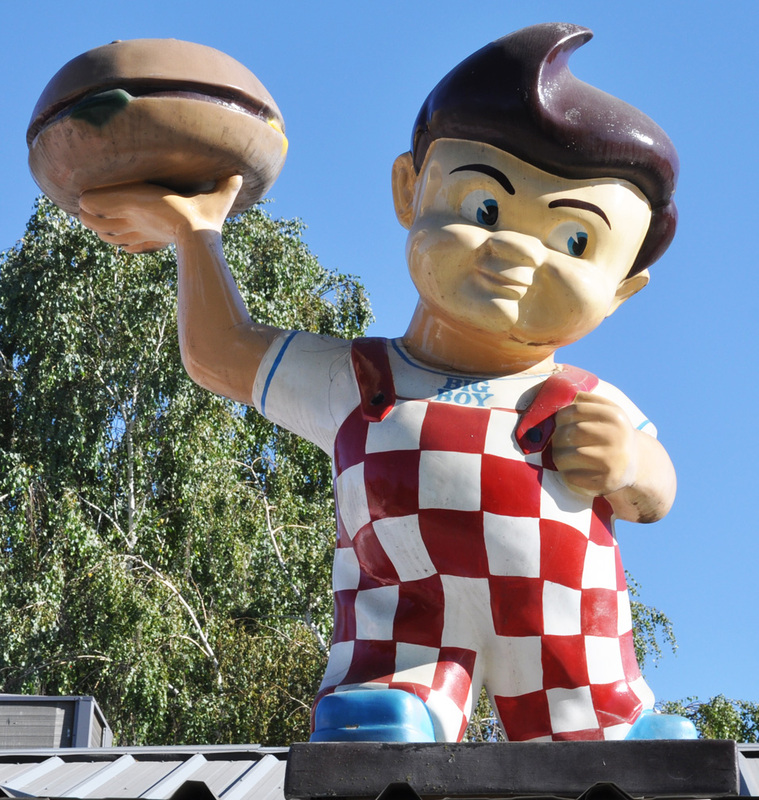 The Bob's Big Boy statue in Alhambra is located inside Noodle World. 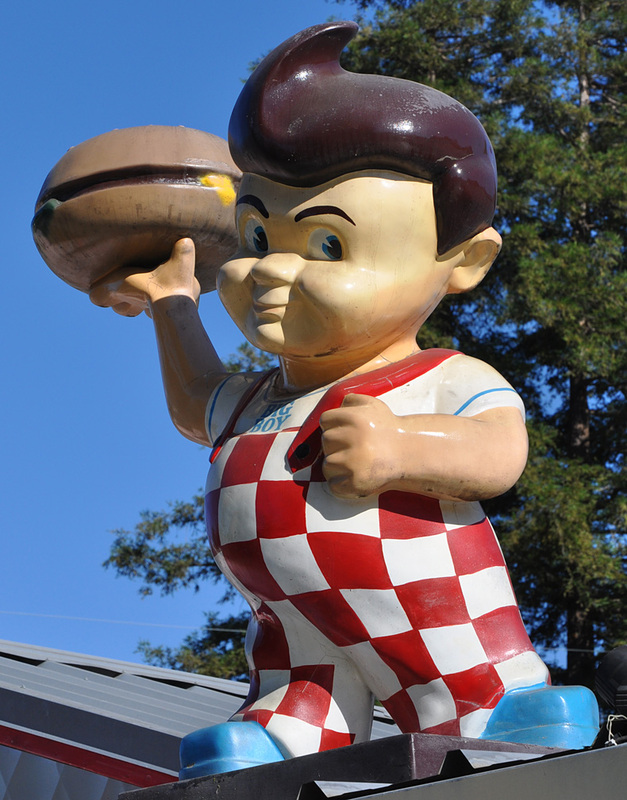 The building had housed a Big Boy restaurant until 1996. 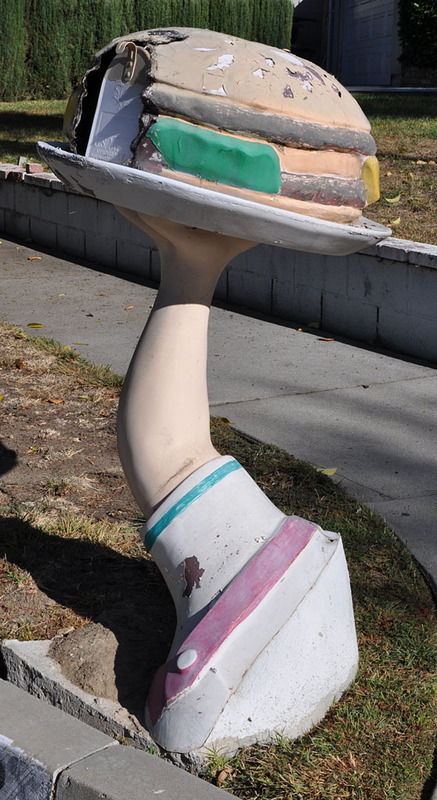 Noodle World's owner bought the statue at a flea market. 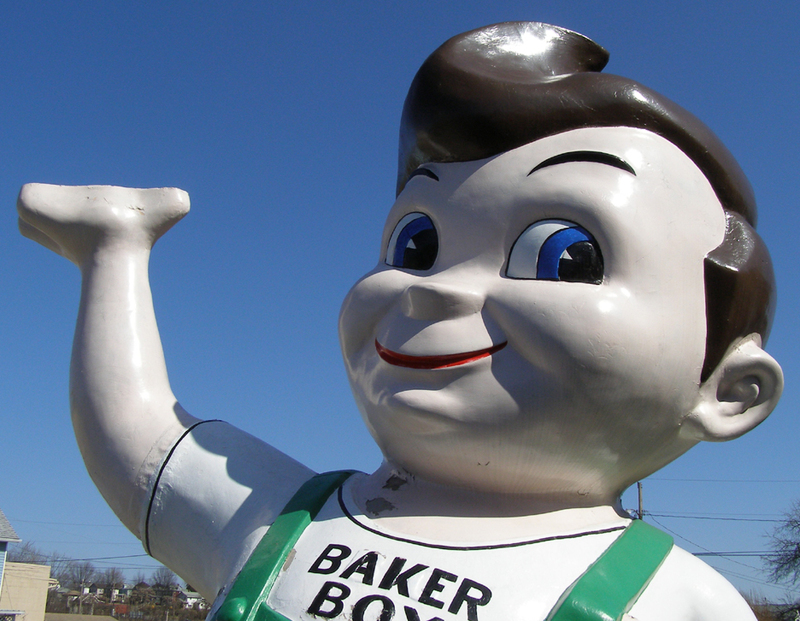 He pays Big Boy $1 per year for the right to display the statue. For more, see these websites: 1 and 2. 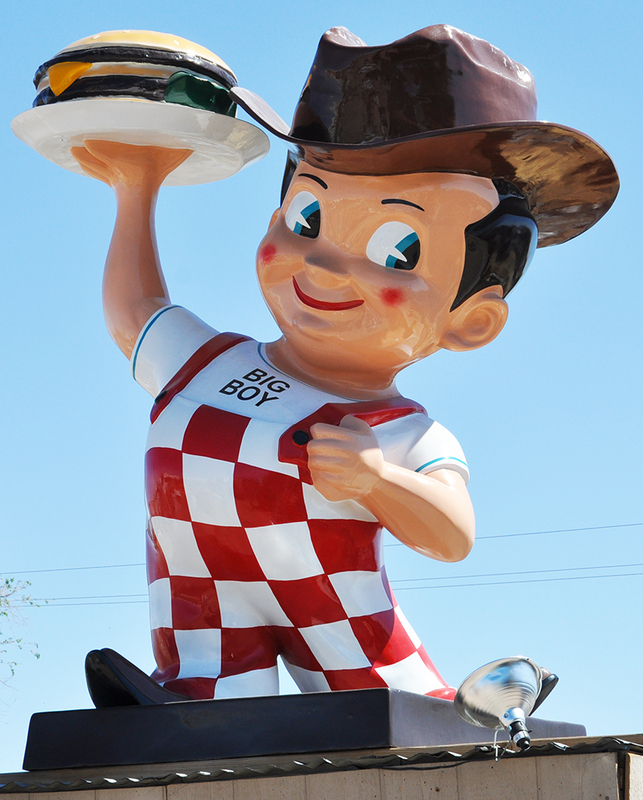 This Big Boy statue in Escondido is located at the Deer Park Winery & Auto Museum. 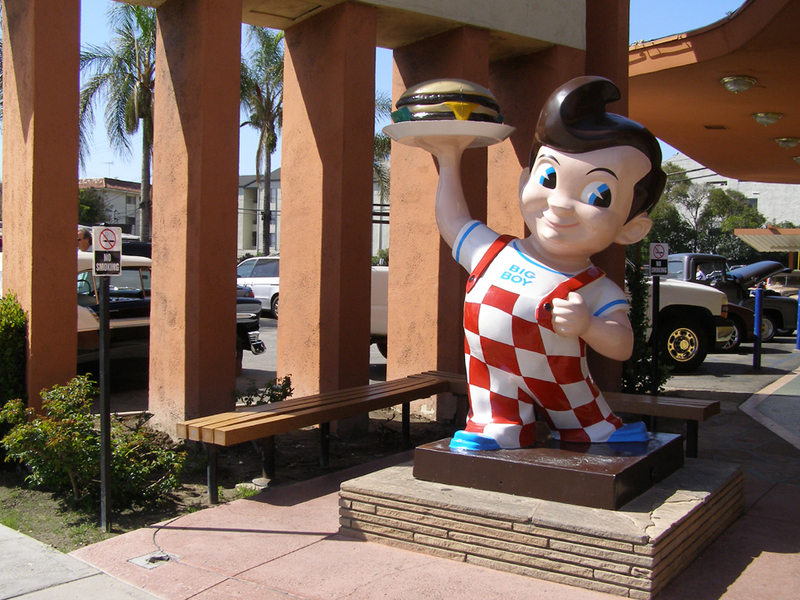 The Bob's Big Boy statue in Burbank is located inside the Gordon R. Howard Museum. 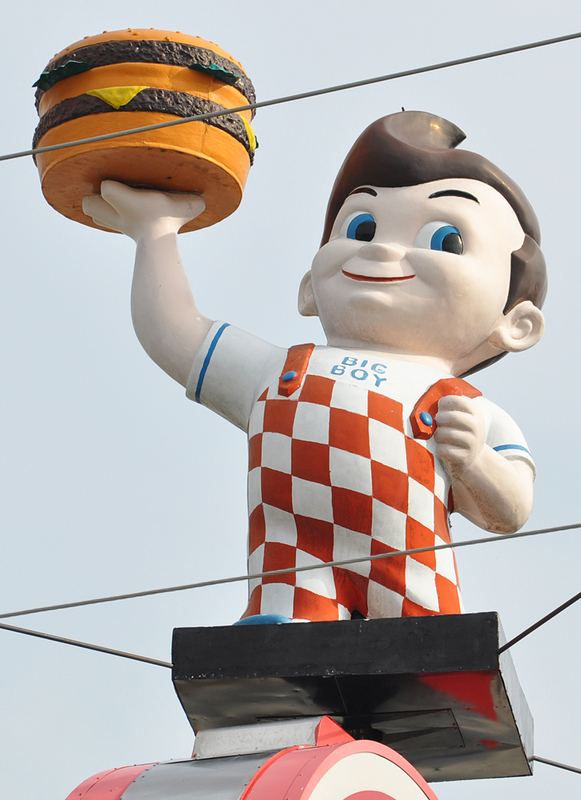 This statue holds his suspenders with both hands instead of a burger. 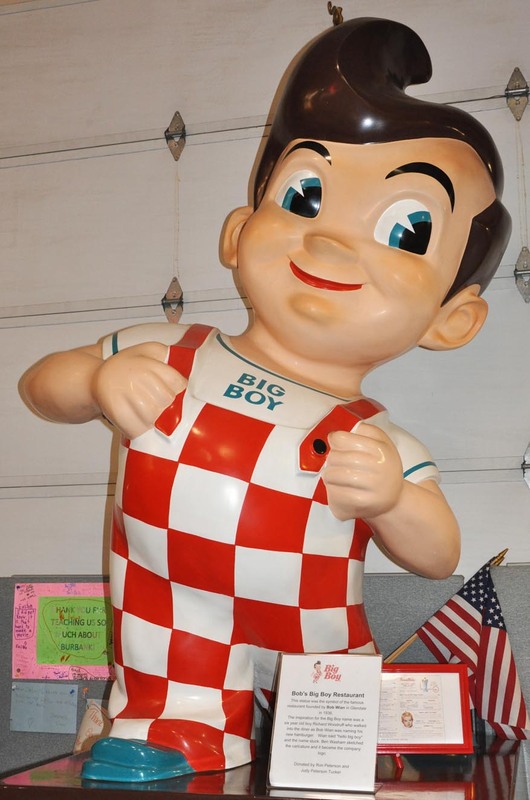 I believe this is an older, rarer 1950s Big Boy statue. 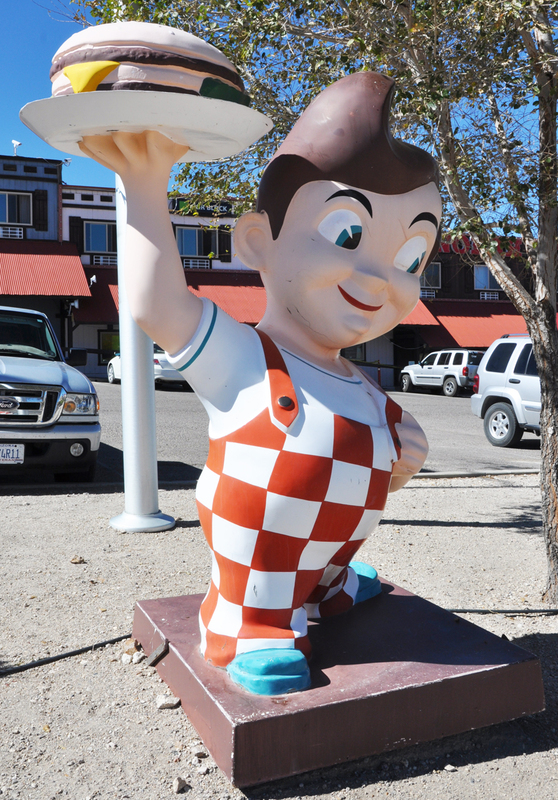 The Bob's Big Boy statue in Tonopah was installed in front of the Tonopah Station Hotel & Casino restaurant. It had been there since around 2008. 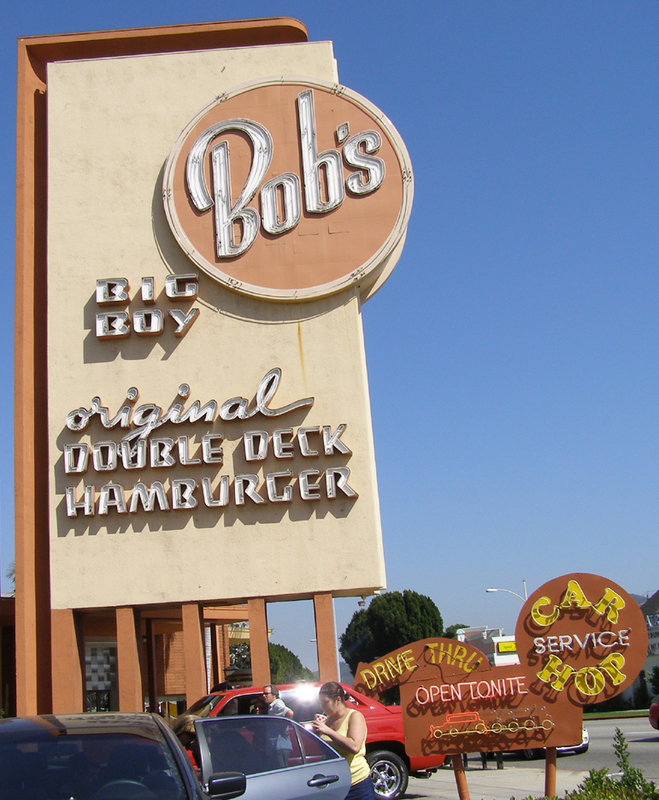 I don't believe there was ever a Bob's Big Boy restaurant there. This photo is from 2017. 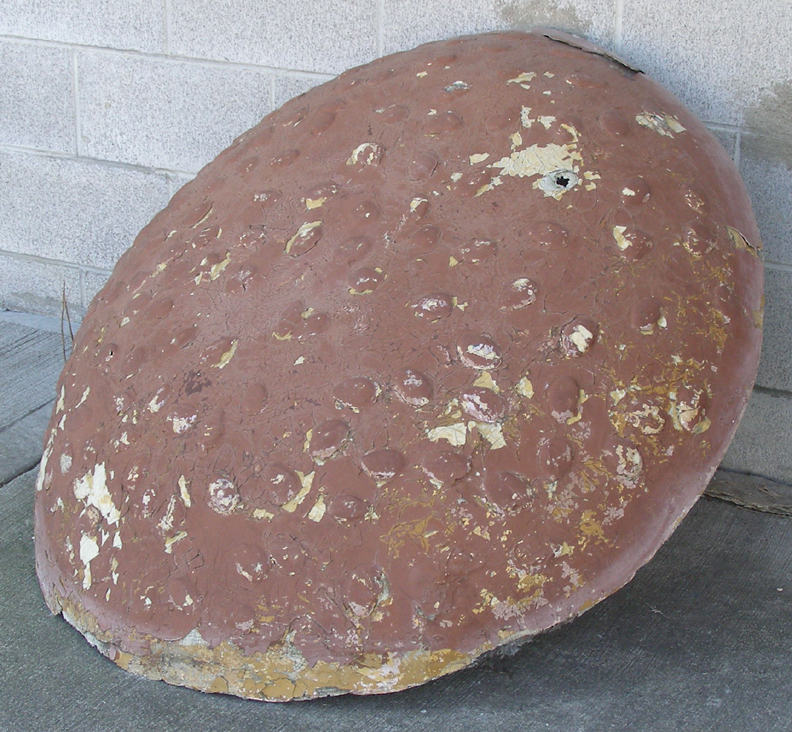 By 2018, the statue was gone. 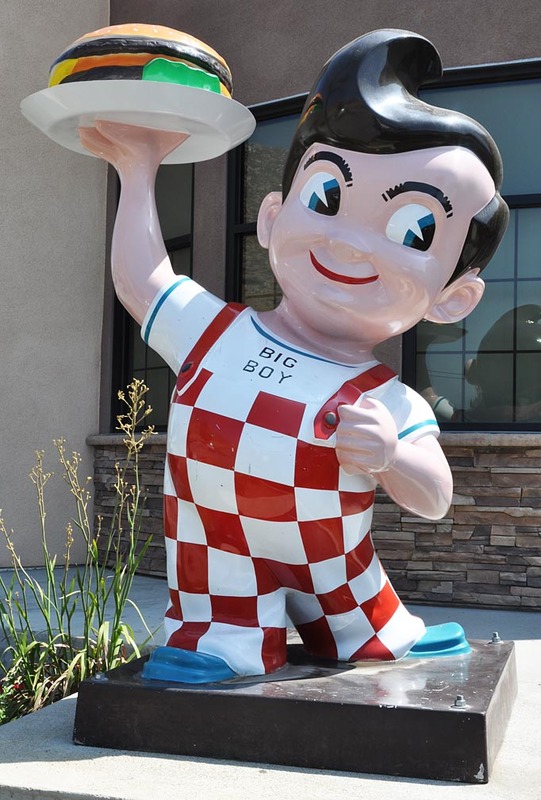 This Big Boy statue in Hesperia is located at Main Street Collectors which produces and sells fiberglass statues. 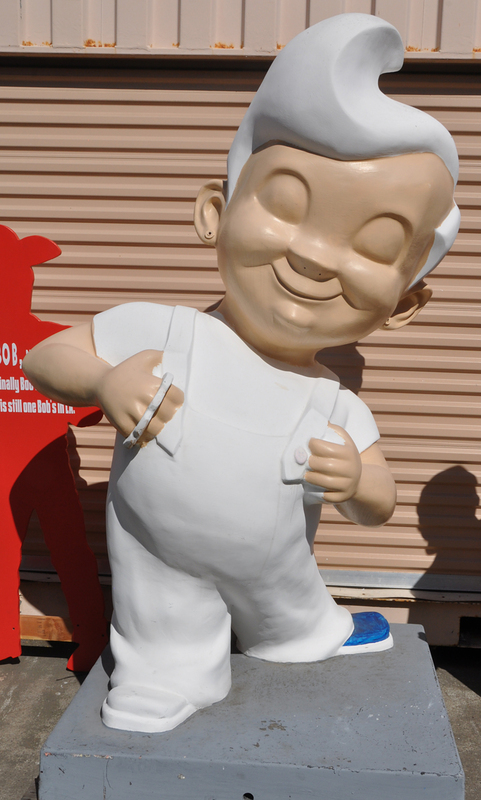 This cowboy appears to be from a different mold from the one in Norco. The hat and burger are different. 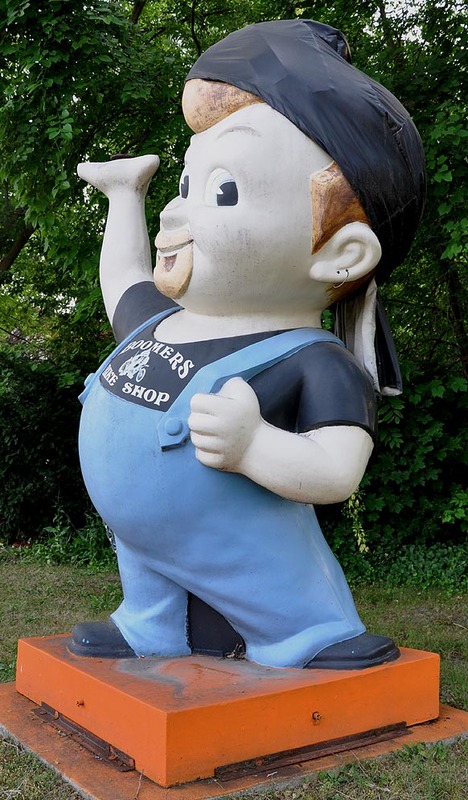 This shop produces the standard Big Boy statues as well. 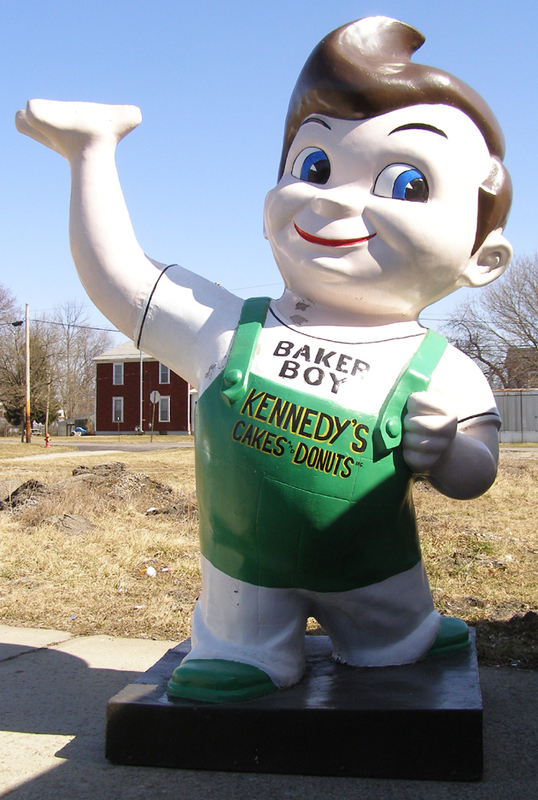 Kennedy's Cakes and Donuts had a repainted Bob's Big Boy statue next to the building. 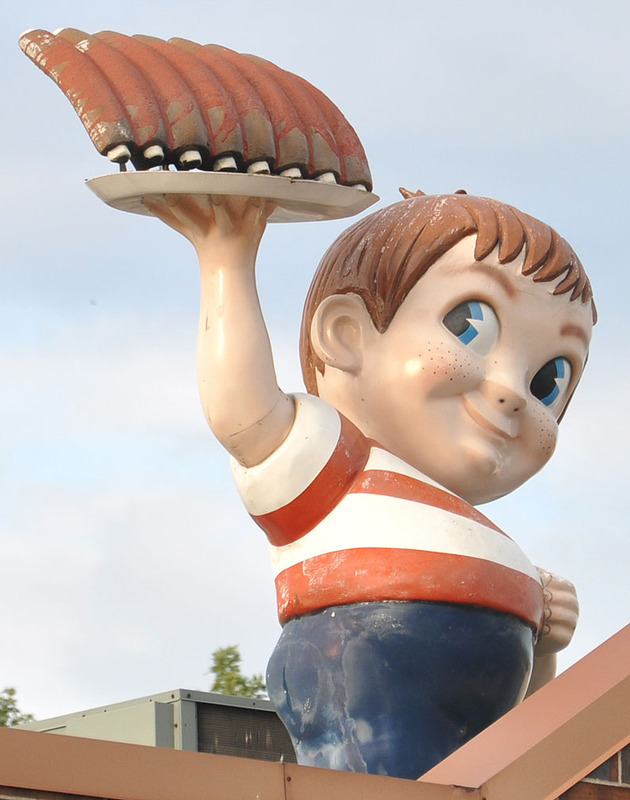 The statue's hamburger leaned against the side of the building. These photos are from 2006. 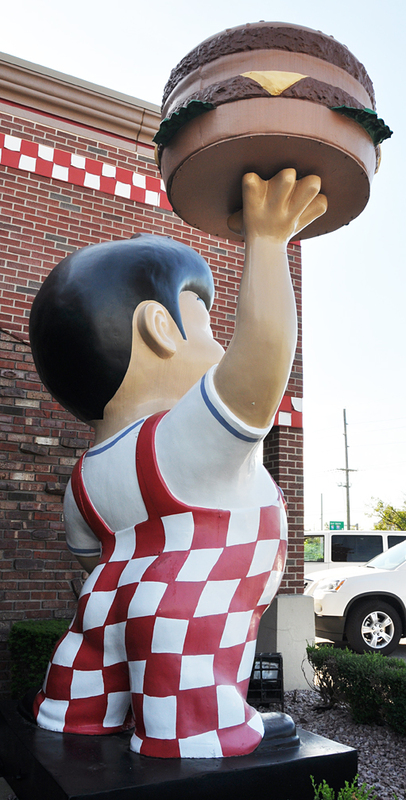 This classic Big Boy statue is 10 feet tall and holds a 40 inch hamburger. 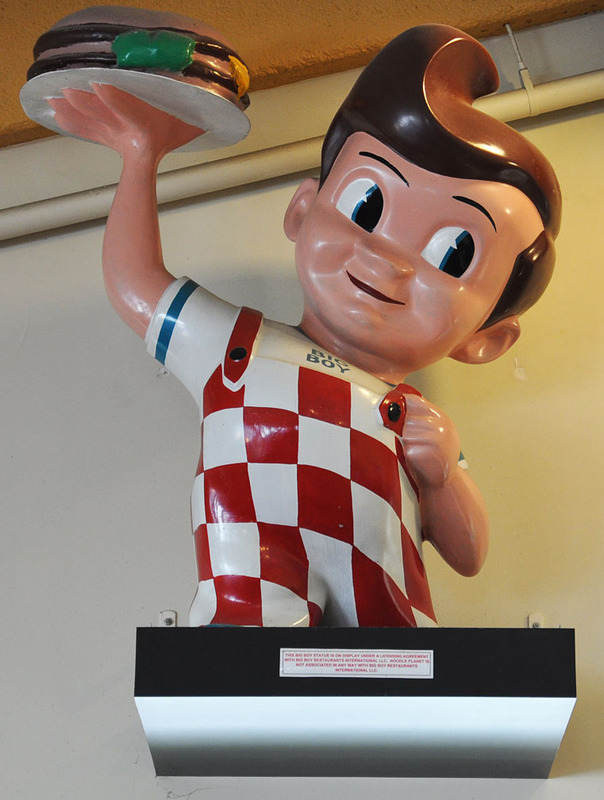 In 2014, the statue was sold and removed. Its new location is unknown. 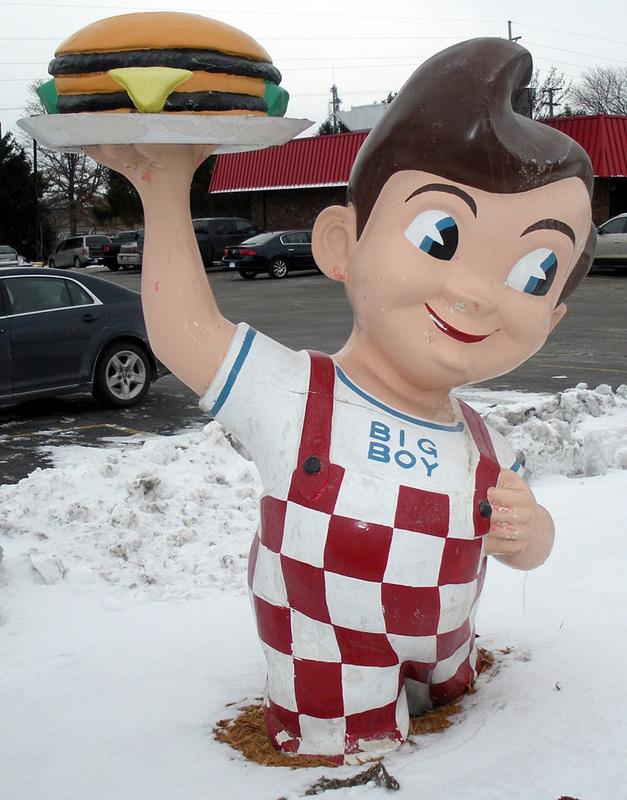 There are still lots of old Big Boy restaurants in Michigan and they are still being built. 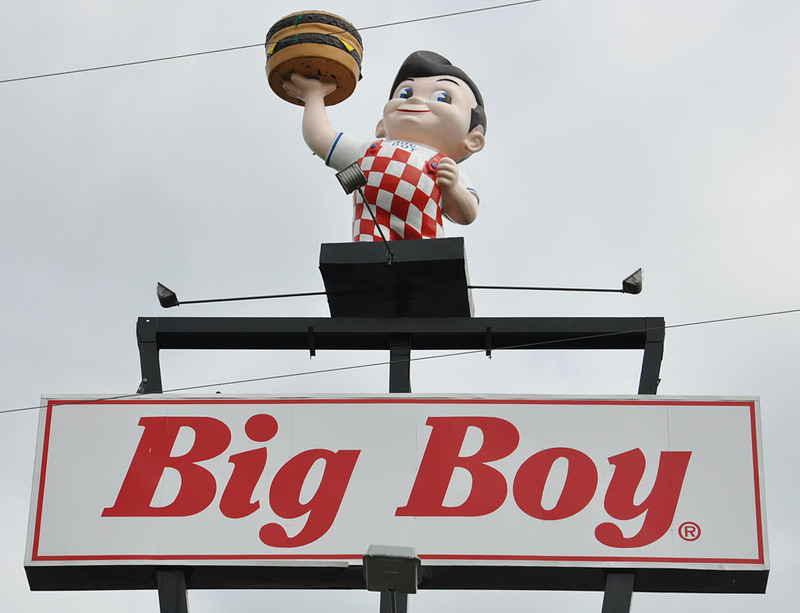 The Livonia location featured a revolving Big Boy statue on top of its sign. 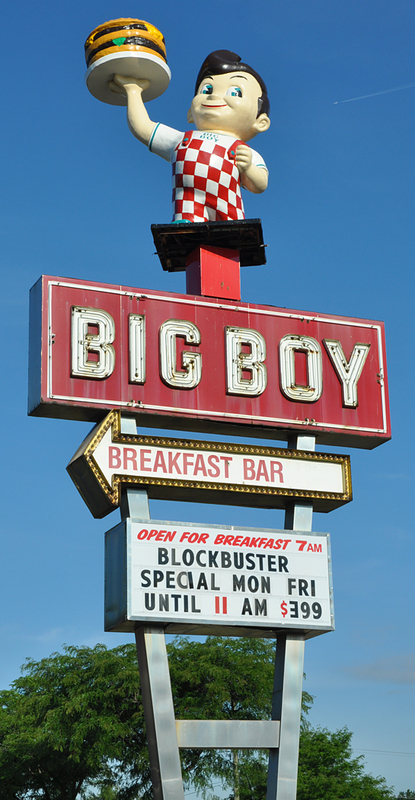 I don't know of any other Big Boy's that have a sign like this or if this one was unique. 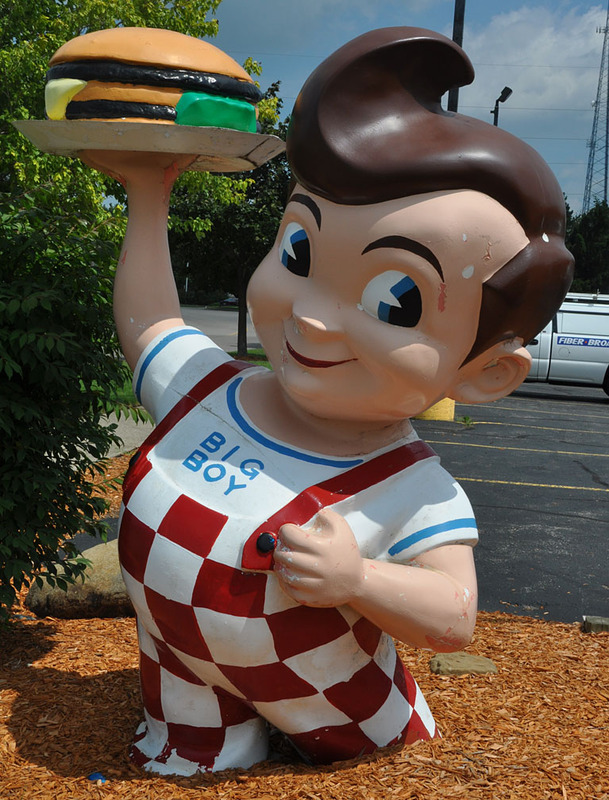 The Big Boy statue in front of the restaurant held both of his suspenders instead of a burger. 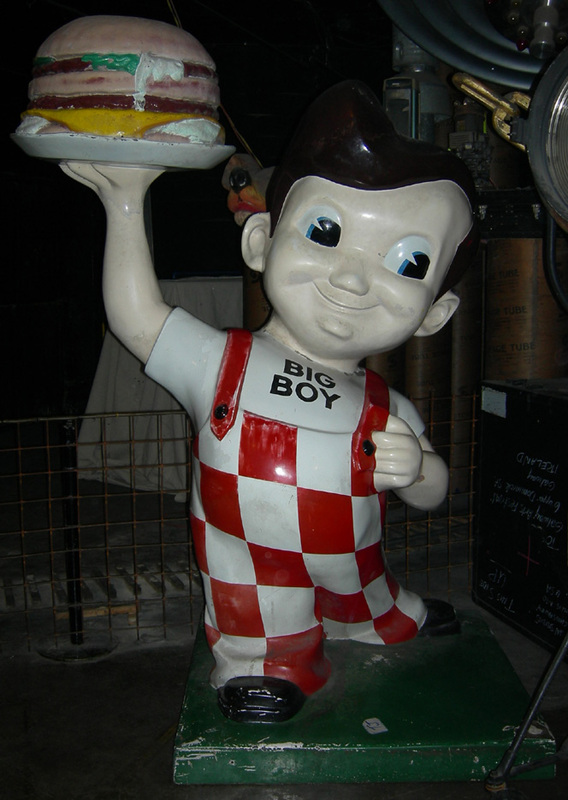 I believe this is an older, rarer 1950s Big Boy statue. There was also another sign on the side street entrance that I missed. These photos are from 2011. 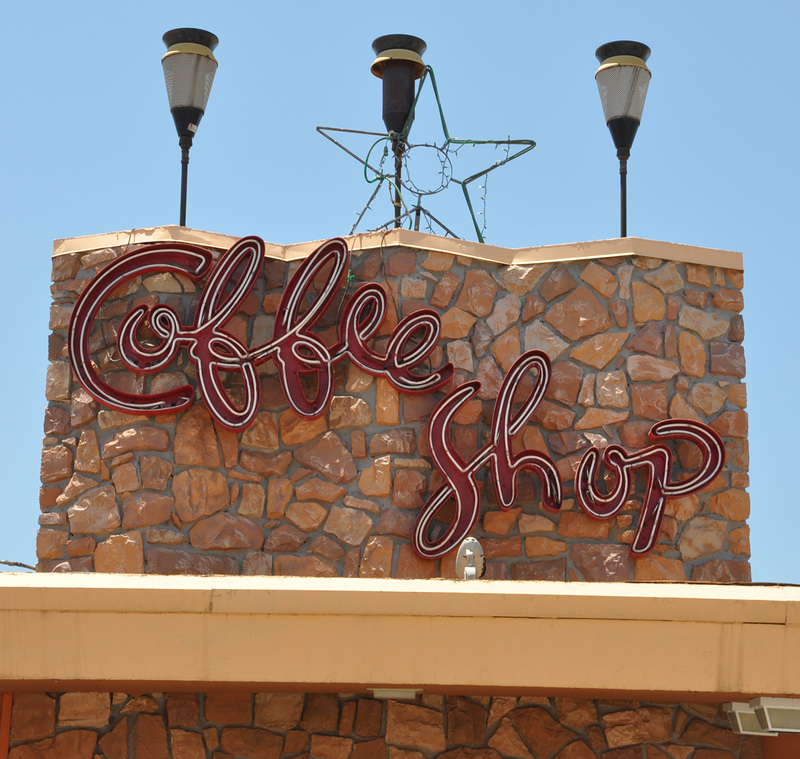 By 2014, this location had closed and the statues and signs were gone. For more, see this website. 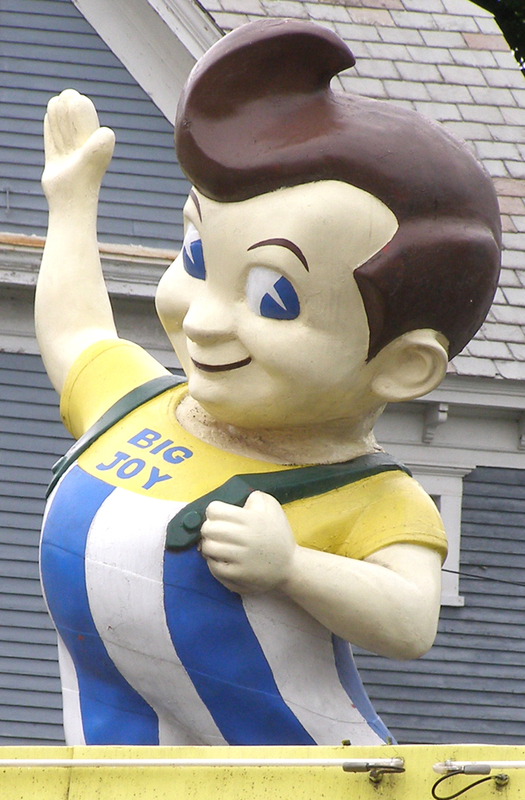 The Brighton location's statue also revolved. There are still a few signs of this design in Michigan. These photos are from 2011. 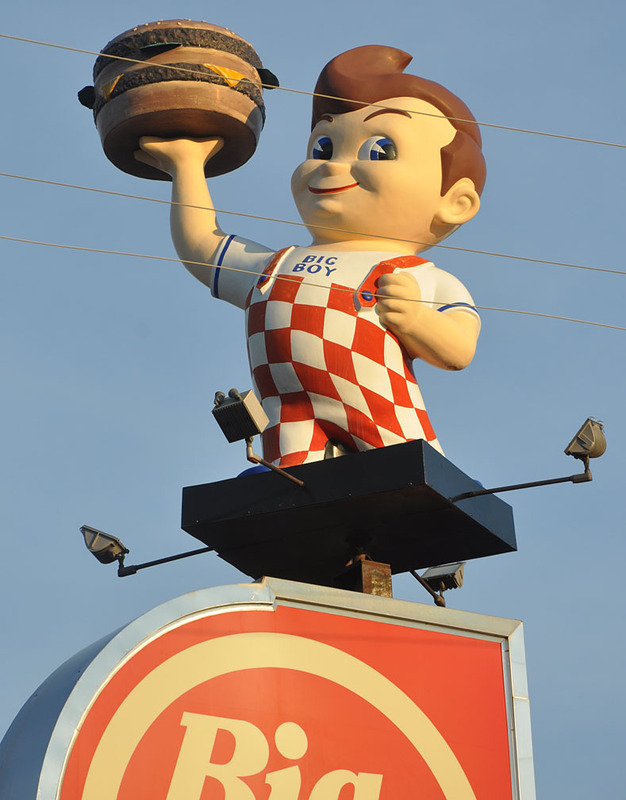 By 2015, the statue and sign had been replaced with a small backlit plastic box sign. 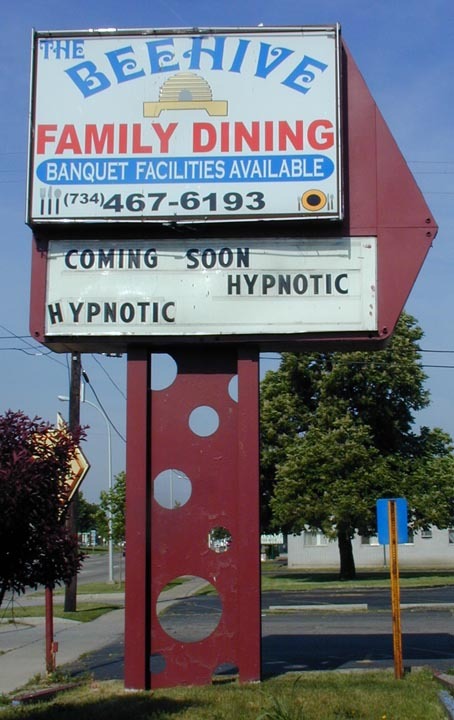 The Fenton location also had a sign with a statue on top. 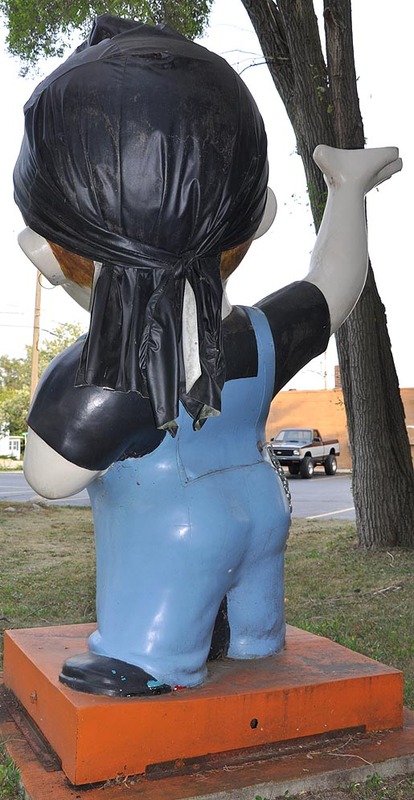 The location closed in 2017 and the statue was gone. I believe this Alma sign was the only one of its kind left. 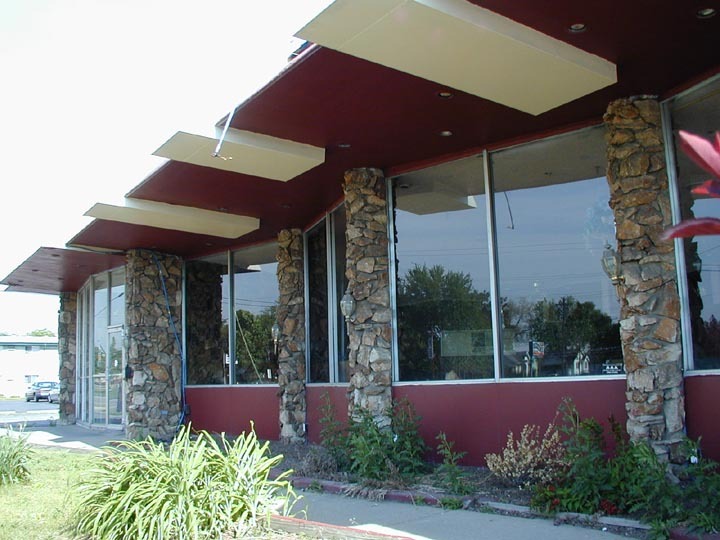 By 2018, the restaurant had become Piper's Grill & Brew and the statue was gone. 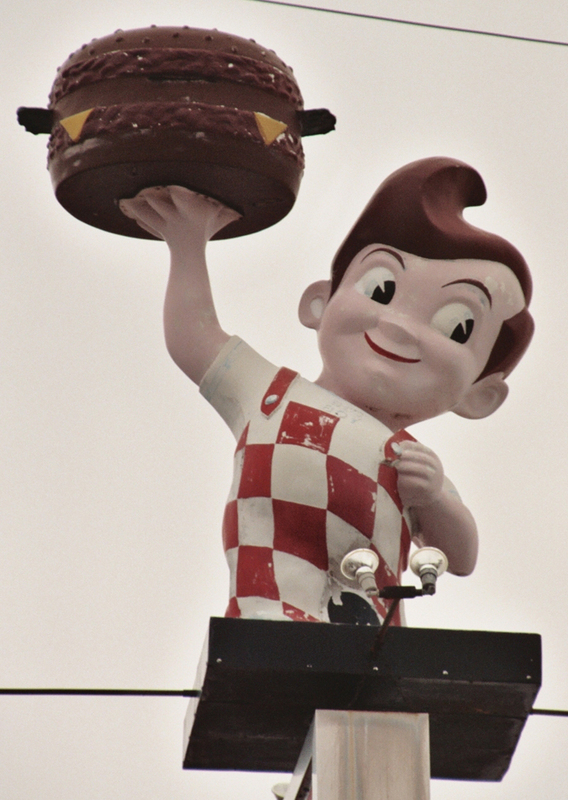 The Detroit Big Boy statue still revolved on top of the sign when these photos were taken in 2011. 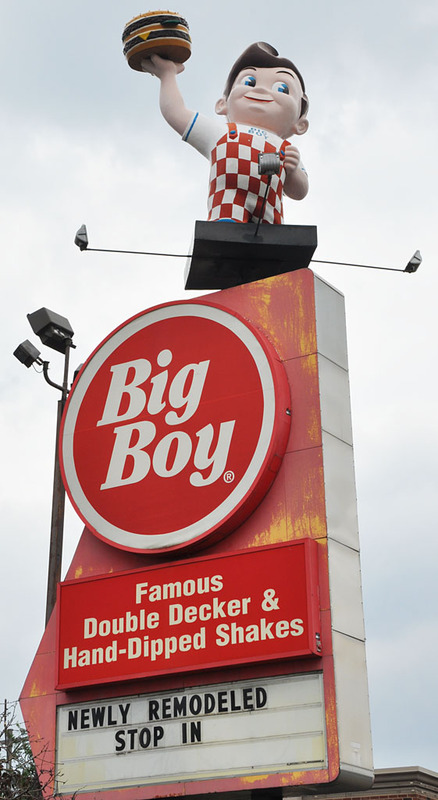 This was the only Big Boy location in Detroit. 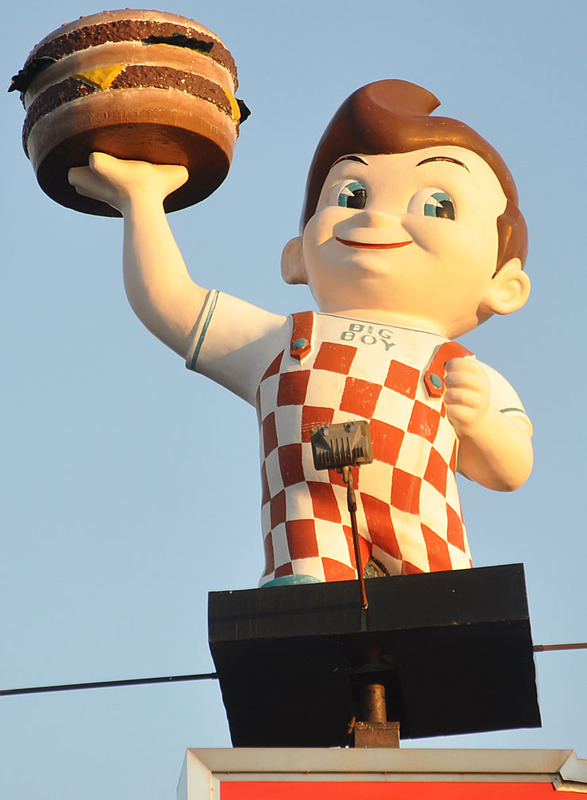 It had closed by 2017 and the statue was gone. 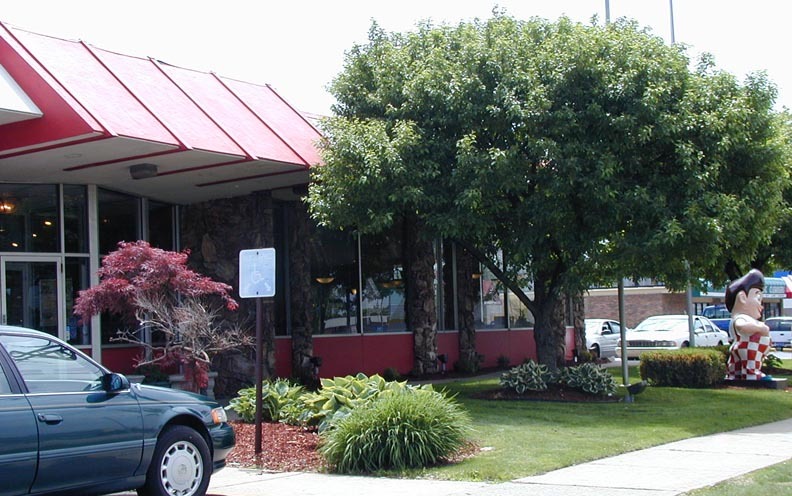 The Pittsfield Township location was built in 2005 and closed in 2009. 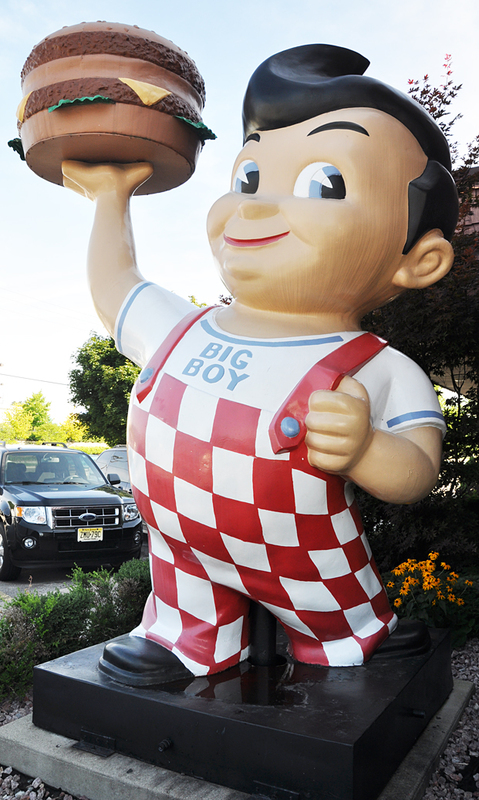 This Big Boy statue is installed in front of the restaurant. 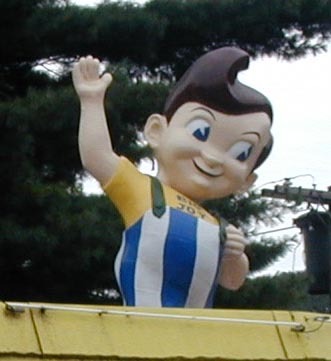 The Milan Big Boy statue had been here since at least the 1980s. This photo is from 2008. 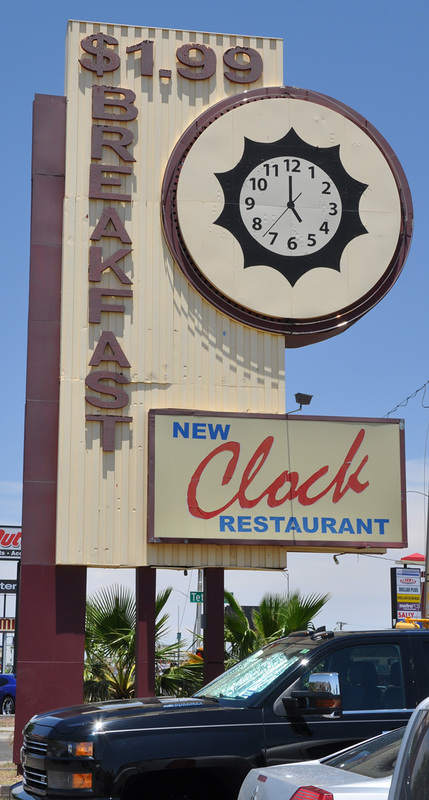 By 2011, the restaurant and sign were still there but the statue was gone. 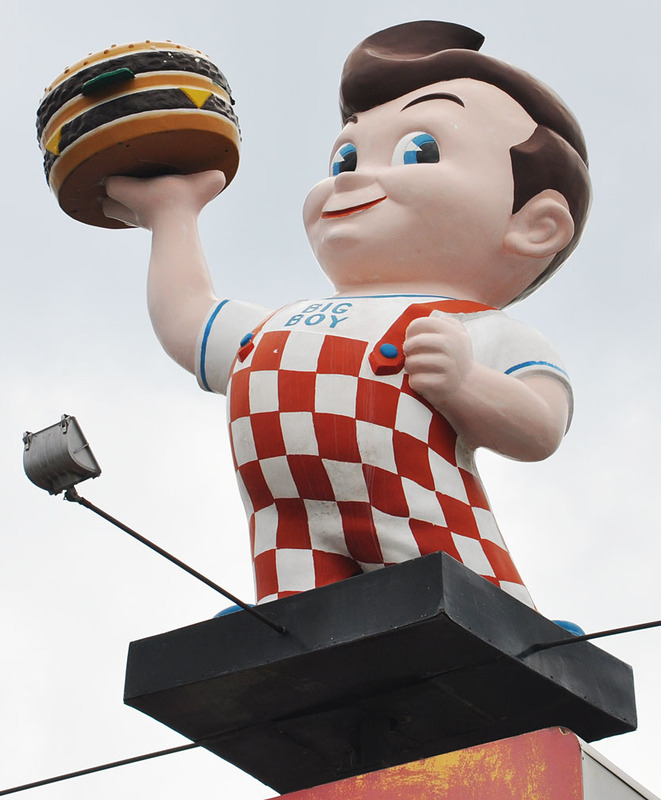 The Waterford Big Boy had another statue example perched on top of a sign. This photo is from 2008. 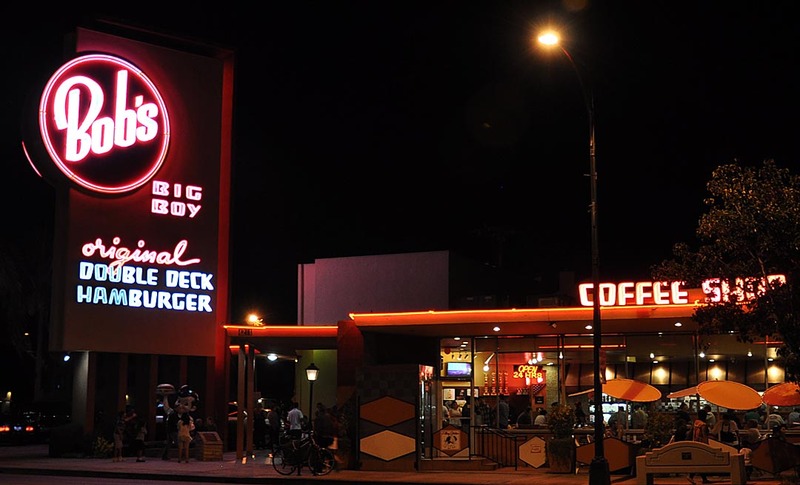 By 2015, the restaurant, statue, and sign were gone. 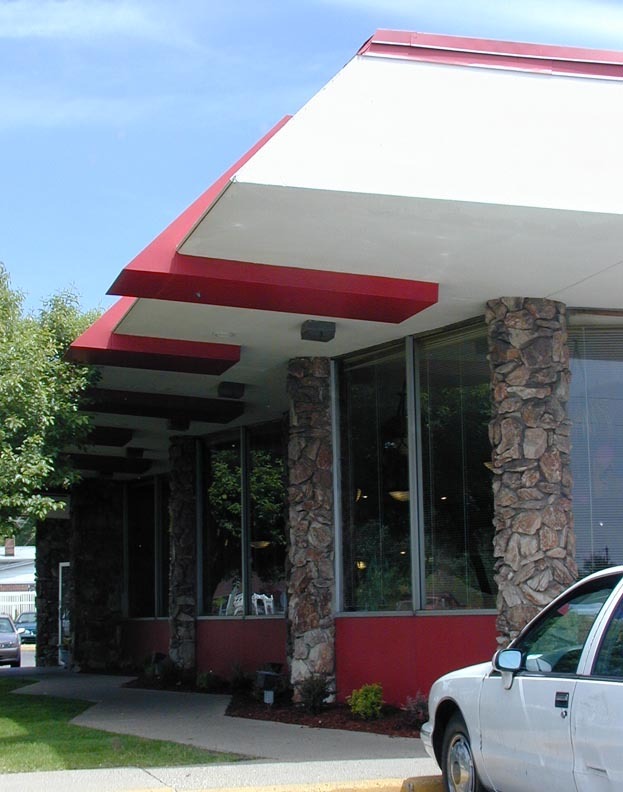 This Big Boy restaurant was built in 1968. 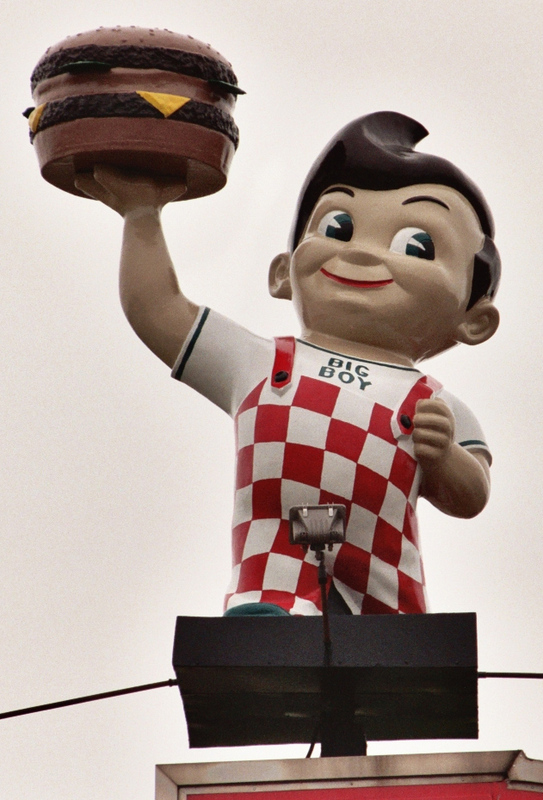 There was a Big Boy statue in front of the building. 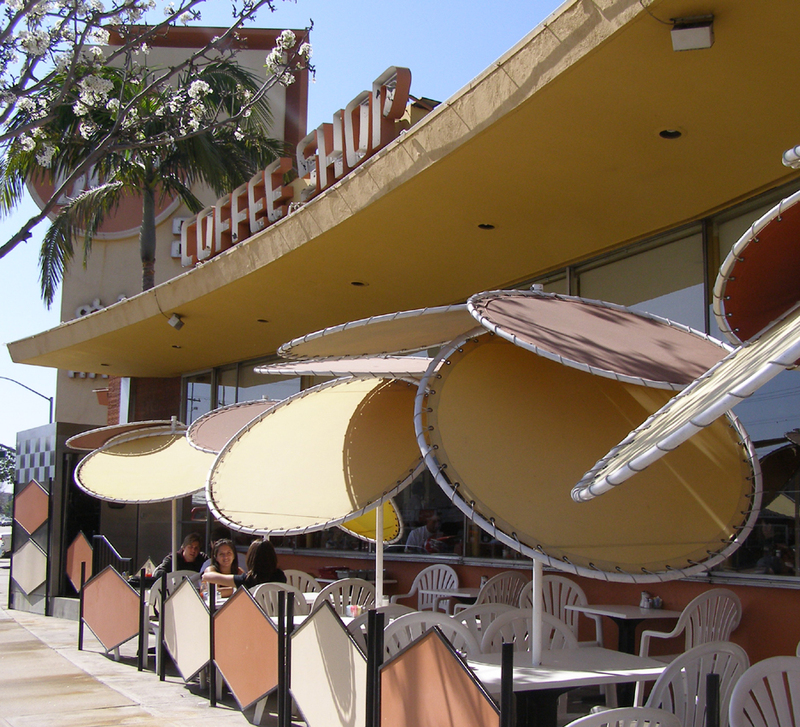 The old sign had been replaced with a modern, plastic one when these photos were taken in 2005. 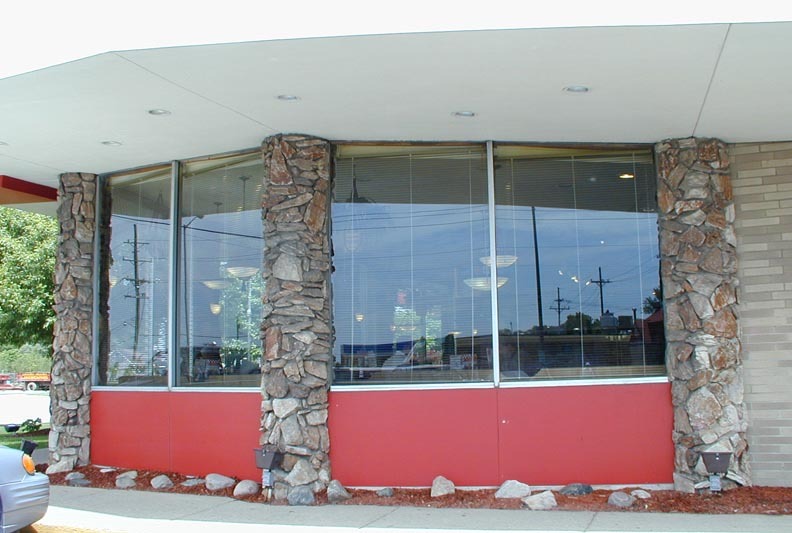 This location has since closed and the building was still vacant in 2015. In 2016, the building had been demolished. 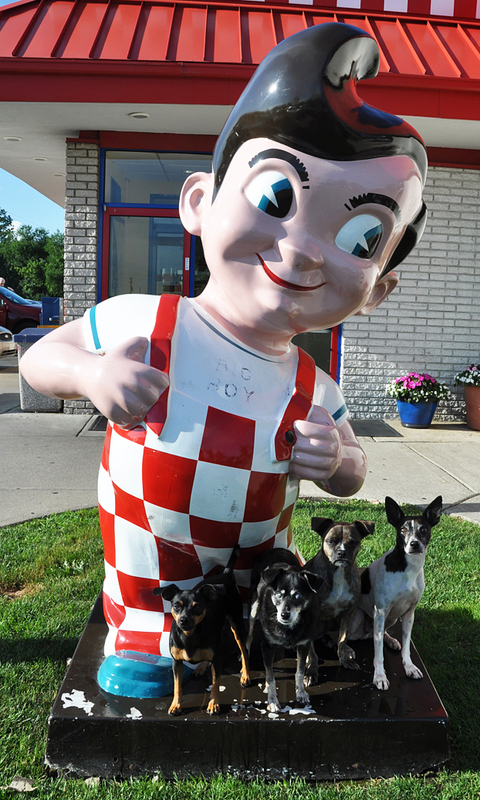 This former Big Boy restaurant has been vacant since at least 2005. I believe Beehive Family Dining was the last occupant. The interior has been gutted. The building was still vacant in 2014. By 2016, the building had been demolished.